I had planned to visit Kettleman's Bagel Co. (912 Bank Street, Ottawa) on Friday for a little lunch. But with a winter storm warning issued for Ottawa, I thought I would visit this morning for a bagel. Coincidentally, in Monday's Ottawa edition of the Metro newspaper there was a coupon for a free Sesame Seed bagel from Kettleman's Bagel Co. in thanks for customers voting them as Metro's Readers Choice Awards for bets bagel. As well, with Kettleman's Bagel Co. also ranking in the top ten on Urbanspoon.com the bar was set high for these little bagels. I entered about 8:20 A.M. this location (there are at least three locations in the Ottawa area) across from Lansdowne Park to find two employees slicing the bagel dough, forming them and a third at the ready to move them into the wood firing oven. I mosied over the cash where I handed over my coupon and placed my order right away. There was no lineup at the cash but service was quick and there was a family of four in the small seating area enjoying their bagels. The Order: 1 plain Sesame Seed bagel and 1 Sesame Seed bagel toasted with cream cheese. The free plain Sesame Bagel was the first casualty to my tastebeds. Absolutlety delicious, just the way a Montreal style bagel should be served. The bagel was warm right out of the woodfired oven after being baked that morning. 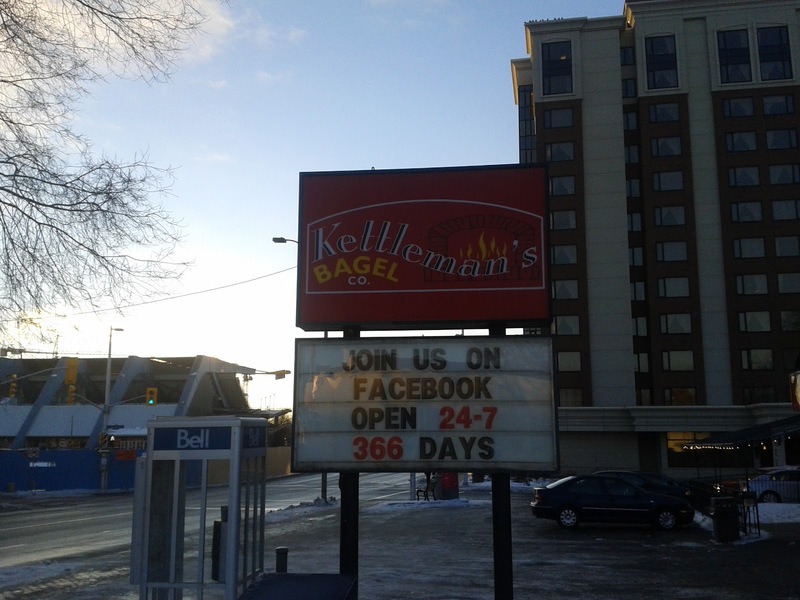 Kettleman's Bagel Co. across from Lansdowne Park. The Montreal style Sesame Bagel led me to contemplate which is better, New York style bagels or Montreal Style bagels. I have now had delicious bagels of both version from my time in Brooklyn, New York and now Montreal style bagels in Ottawa at one of Ottawa's best bagel places. My taste buds will continue this great debate but first, a little cream cheese and another Montreal style bagel were ready. The Sesame Bagel with cream cheese was also delicious. Kettleman's does not skimp on the cream cheese either. So it is a freshly baked bagel with gobs of great tasting plain creamcheese. Your tongue doesn't know which is better tasting the cream cheese or the freshly baked bagels. Yet another delicious debate courtesy of Kettleman's. Overall, Kettleman's Bagel Co. lives up to the acclaim. Delicious freshly made bagels direct from a woodfired oven are reasonably priced. It makes for a great breakfast and lunch place for bagels and bagel sandwiches available. It is worth the walk to this location as it is in the scenic Glebe area of Ottawa.